For hundreds of years, humans have selectively bred species. Farmers selected crops with the best traits, dogs with the most favorable traits, livestock that produced the best milk/eggs/meat. These are all examples of selective breeding and cause a species to change over time. Today, humans can still cause species but on a far more advanced level. Using modern DNA technology humans have the capability to manipulate species on a genetic level; species can have their traits modified now by manipulation of DNA rather than just selective breeding. For example, corn has been genetically modified to increase overall production, have resistance to insects, shorter growing cycles, etc. 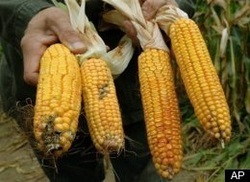 This is an example of a genetically modified organism (GMOs). GMOs have become extremely common; believe it or not, you have probably consumed a GMO! This unit will examine how GMOs are produced while examining whether they provide a solution to the issue of global hunger. Why do Glo Fish glow? Are GMO’s the most effective, safe, and inexpensive way to provide food for the 7 billion human people on Earth? NY Times, Why aren't GMOs labeled? The Guardian: Synthetic Biology & the Rise of the "Spider Goat"
NY Times: Golden Rice, Lifesaver?